Mommies have magical abilities and super powers. Even if you are not a mommy, you may remember the magical abilities of your mom. One of her great powers is that of Mommy Kisses. From bumps and bruises to scrapes and scratches, a mommy kiss can cure it all. With two young boys, I feel that some days I’m in a constant state of pucker. Between my youngest exploring boundaries and learning new skills (like climbing everything in the house) and my older boy, whose famous words are Hey mom, look at this!, I live in a house of constant boo-boos. Some household injuries go beyond wild and crazy children. Accidents happen and sometimes you just don’t see it coming. Last year we had one of the scariest ones I’d ever had. I should insert now that both my husband and I have medical backgrounds. We know how to treat injuries until professionals can step in. We’ve been trained and had it ingrained in our heads. Both of us have dealt with serious situations in the workplace and dealt with it appropriately. One night I was making dinner and the kids were of course underfoot. I had one of those days and made Spaghettios as a cheat dinner. I pulled our youngest’s serving first so it would have a chance to cool. He was maybe one year old at the time. Knowing he could now reach the high chair tray, I put it on the counter top and went back to the stove to get servings for the big kids. I thought my youngest had gone into the living room with the big kids. I was wrong. All of a sudden behind me is a scream that I will never get out of my head. The little one had reached up to grab his bowl and the insanely hot Spaghettios had pour down his chest. I snatched him up and my husband ran into the room. “What do I do? What do I do!” I kept yelling. My husband instantly grabbed the dish towel, ran it in cold water and covered his chest. Then he grabbed my son from me, ran to the bathroom, and turned the shower on cold. Fully clothed and baby in hand, he got under the spray. During this time my brain clicked back into gear. I ran to the bedroom, grabbed my shoes and some blankets and went back to collect my son who was crying this horrible, raspy cry of pain. I stripped his clothes (shocked at the sight of his chest), wrapped him in the blanket, and got him in the car. The twenty minutes to the hospital was the world’s longest drive ever. The ER said that my husbands act of first aid saved the skin on his chest. He may never grow chest hair or get a tan in that spot (though we’re Irish, so he probably wouldn’t tan anyway), but his skin had been saved. In summation, first aid is a skill everyone in the home should know, just in case mommy kisses aren’t enough. My son’s neck one week after getting burned. Clove Oil: Clove oil is a natural numbing ingredient. I can be use to numb cuts and it even helps with bruises. Hydrogen Peroxide: When soap and water isn’t enough to clean a wound, hydrogen peroxide will deep clean. Tea Tree Oil: Tea tree oil is a major staple in our home due to its antimicrobial properties. We use it in our DIY Cleaners, but it also works as an antimicrobial cream. Aloe Vera: It is wise to keep an aloe plant in your home. Whether it’s a sunburn or cooking burn, snap off a leaf and squeeze a little of the clear fluid on the injury. It works well on minor scrapes as well. Calendula: A tincture made from calendula can call soothe and heal burns. You can buy this tincture at a health food store or make your own. Honey: Honey also has amazing healing a soothing properties. Just make sure if you’re using honey for medicinal purposes, you get the purest form you can find. Arnica: Arnica is available at health food store in tablets. Arnica reduces pain and inflammation. Ginger: From menstrual cramps to headaches and arthritis, ginger is the anti-inflammatory for all your aches and pains. The best part about ginger is it tastes good. If you suffer from chronic pain, try adding ginger to your meals. Turmeric: Turmeric is another great anti-inflammatory/pain reliever that can be added to your daily diet. It is used in many mid-Eastern and Asian dishes. ACV (Apple Cider Vinegar): Diluted in water, ACV can help an upset stomach. As part of a daily regimen, it can help general digestive issues. ACV can also be used as a skin astringent or in the bath tub to fight yeast infections. Epsom Salt: You can drink epsom salt in water to get constipation relief. You can also soak your backside in an epsom salt bath to relieve hemorrhoids. Papaya: Dried papaya is the only reason I survived pregnancy. If your stomach is feeling off kilter, papaya is a great way to smooth things over. Peppermint: Peppermint is a great digestive solution because it is available in many forms. Peppermint candies can be sucked on, you can chew peppermint leaves and you can drink peppermint tea. Using the herbs above, you can’t always have fresh on hand. Sometimes you need a way to preserve them or make them into the type of material required for application (cream, oil, salve). To do that, you need to make a tincture or glycerite. Tinctures and glycerites are concentrated herbal extracts in liquid form. My friend over at Pixie’s Pocket has a great guide on how to make your own, and it’s not as hard as you would think! If you really want to jump on board the natural medicine boat, be sure to check out Herbal Academy of New England. They offer amazing posts on herbal alternatives, including this one about making herbal glycerites (tinctures without alcohol – which is perfect for children). Herbal Academy of New England even offers online classes you can take. They teach you things you didn’t even know you wanted to know. I highly recommend them. 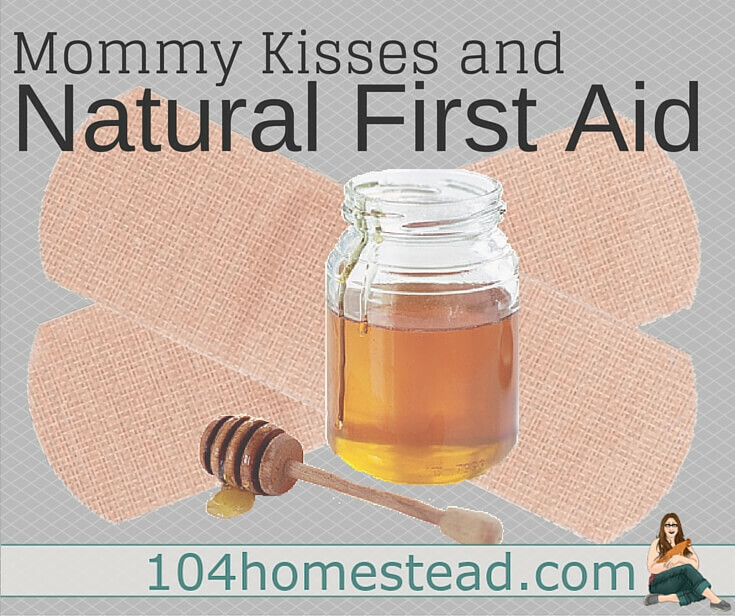 So remember, be prepared for all those boo-boos and ailments that Mommy Kisses can’t cure. I know we mommies are super heroes, but we can’t do it all. 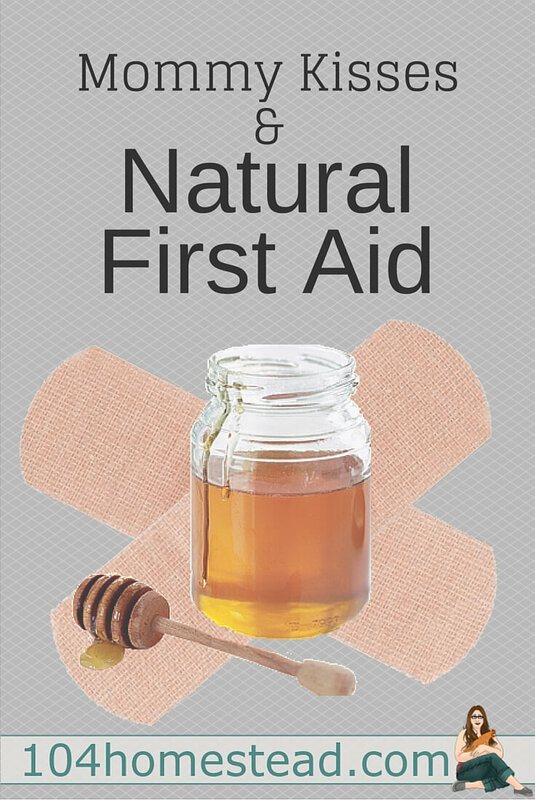 Have a natural first aid kit on hand just in case. Glad everyone is okay. These are some wonderful natural remedies; reminds me of my old product formulating days. Wow, thanks for posting about such a traumatic thing. We live in a very remote location and it is a very long drive to the hospital too. I appreciate the reminder regarding burns and also a good reminder to update the medical supplies. Thanks for sharing and I am so glad to know that your little one is okay! Oh, gosh…I can’t even imagine hearing that shriek! *shudder* I’m so glad the wee one was ok! My husband outlawed the eating of Spaghettios for a year after. I now put things as far back on the counter as I can. Definitely changed our view on safety measures.